Download the Add-In here: http://hubs.ly/H064q_J0. With Xometry, it’s incredibly easy to get an instant quote. Now we’re making it even easier. 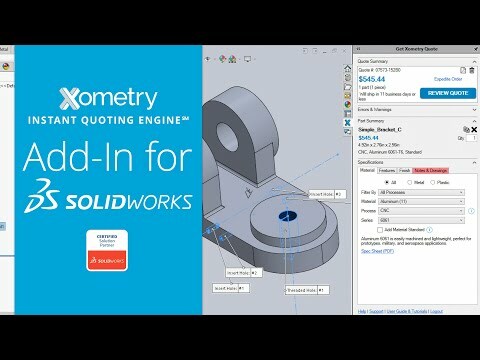 We’re excited to announce our free Xometry Add-In for SOLIDWORKS! MecSoft Corporation, the developer of industry leading CAD/CAM software solutions, has announced the launch of a new configuration to the Milling module of its popular CAM software product line, called Xpress. This configuration is tailored for the growing community of makers, tinkerers, and DIY’ers who are looking for an easy to use, inexpensive but powerful software solution for programming CNC mills. MILL-Xpress will be available for VisualCAD/CAM, RhinoCAM and VisualCAM for SOLIDWORKS. MecSoft Corporation, the developer of industry leading CAD/CAM software solutions, has announced the availability of VisualCAM 2016 for SOLIDWORKS, the latest version of MecSoft’s integrated Gold Certified CAM solution for SOLIDWORKS. MecSoft Corp., the developer of industry leading CAD/CAM software solutions, has announced the availability of RhinoCAM 2016, the newest version of MecSoft’s integrated CAM solution for the Windows version of Rhinoceros 5.0. MecSoft Corporation announces the release of VisualIMPORT for Onshape. VisualIMPORT for Onshape allows access to the users’ on-line Onshape account from inside VisualCAD, enabling users to view and import part files from their Onshape account.